SURPRISE YOUR LITTLE ONE WITH A SURPRISE FROM THE EASTER BUNNY! 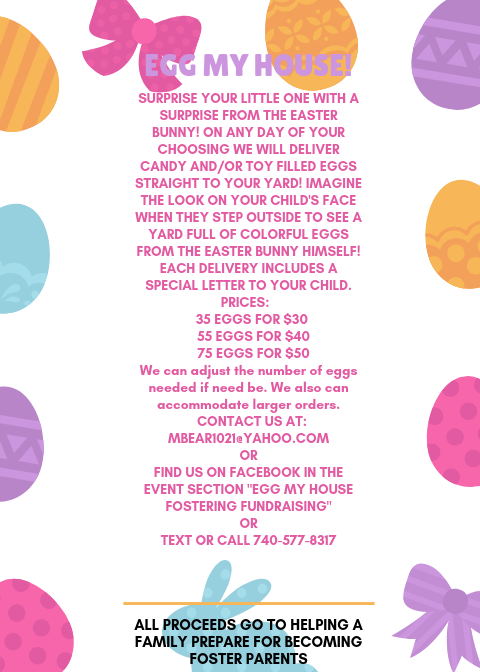 ON ANY DAY OF YOUR CHOOSING WE WILL DELIVER CANDY AND/OR TOY FILLED EGGS STRAIGHT TO YOUR YARD! IMAGINE THE LOOK ON YOUR CHILD’S FACE WHEN THEY STEP OUTSIDE TO SEE A YARD FULL OF COLORFUL EGGS FROM THE EASTER BUNNY HIMSELF! EACH DELIVERY INCLUDES A SPECIAL LETTER TO YOUR CHILD. We can adjust the number of eggs needed if need be. We also can accommodate larger orders. All proceeds go to helping a family preparing to becoming foster parents.